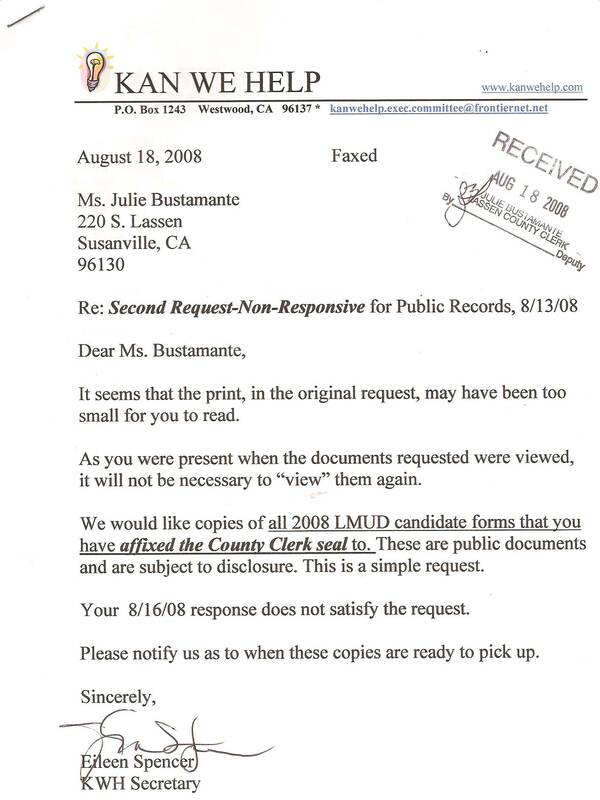 Dec. 8, 2008: LMUD General Counsel ignores request for a copy of the February17, 1999 UAMPS Agreement. Second request submitted. 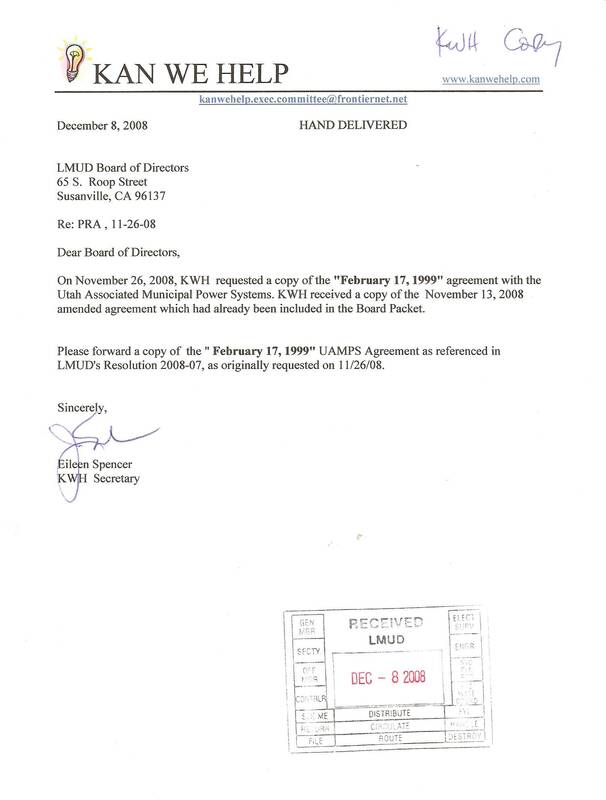 Dec. 12, 2008: LMUD cannot produce the February 17, 1999 UAMPS contract. 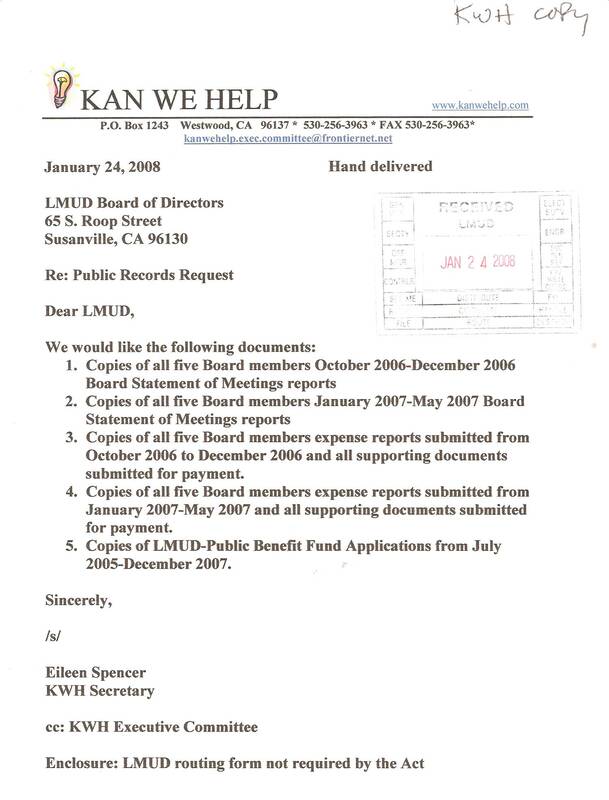 LMUD's first involvement with UAMPS was December 26, 2006. 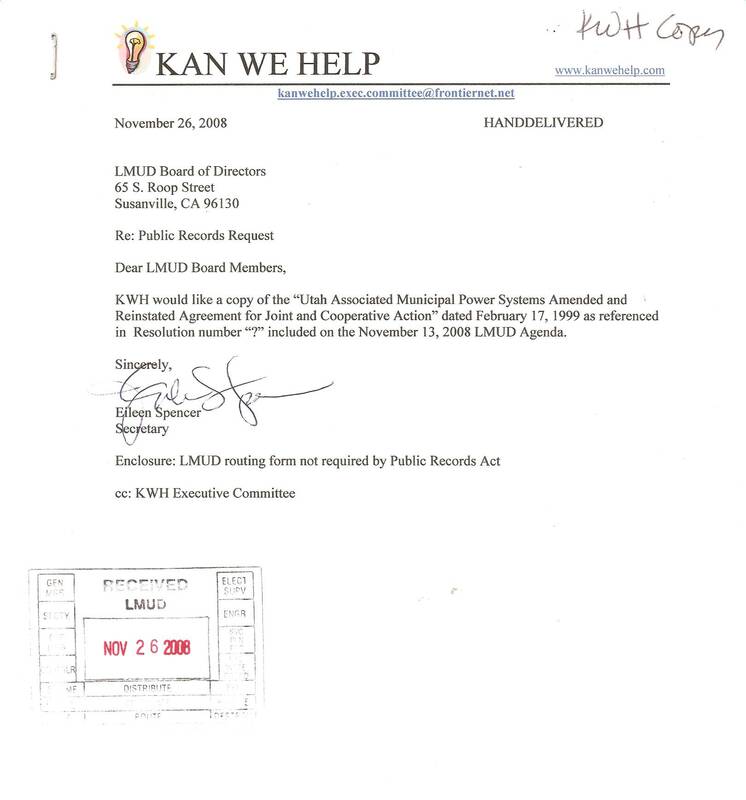 Documents provided by LMUD show that the LMUD Board approved a "first" and "second" amendment to the original UAMPS agreement on December 26, 2006. 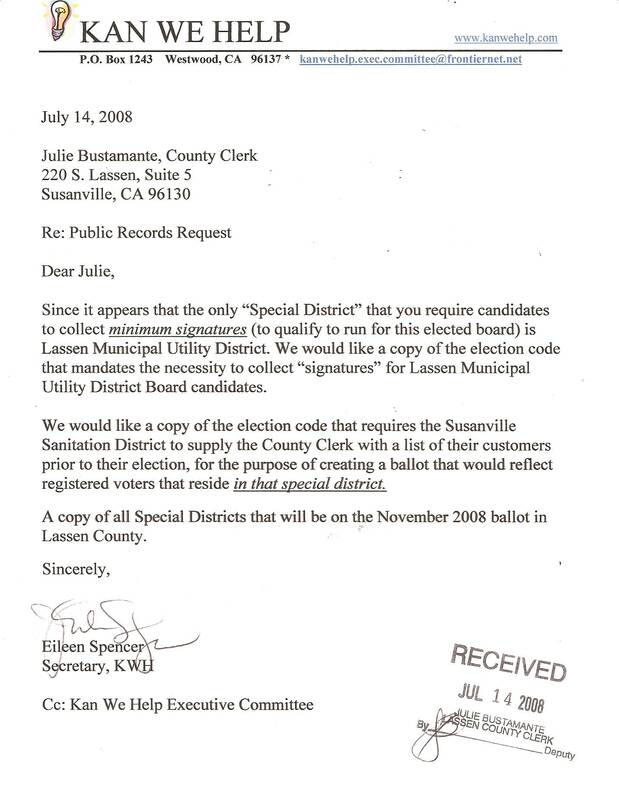 8/20/08: Lassen County Clerk releases some election documents but not all requested. 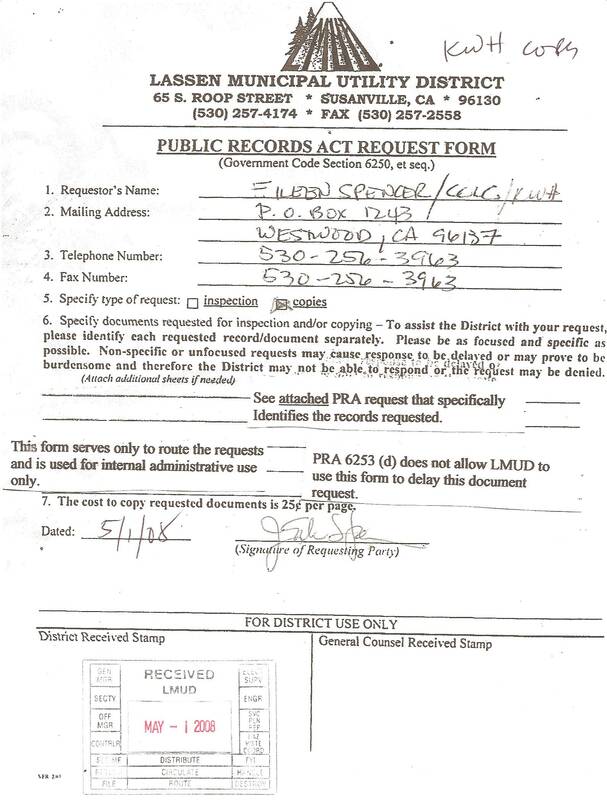 In doing so she has violated California Election Code 17100. 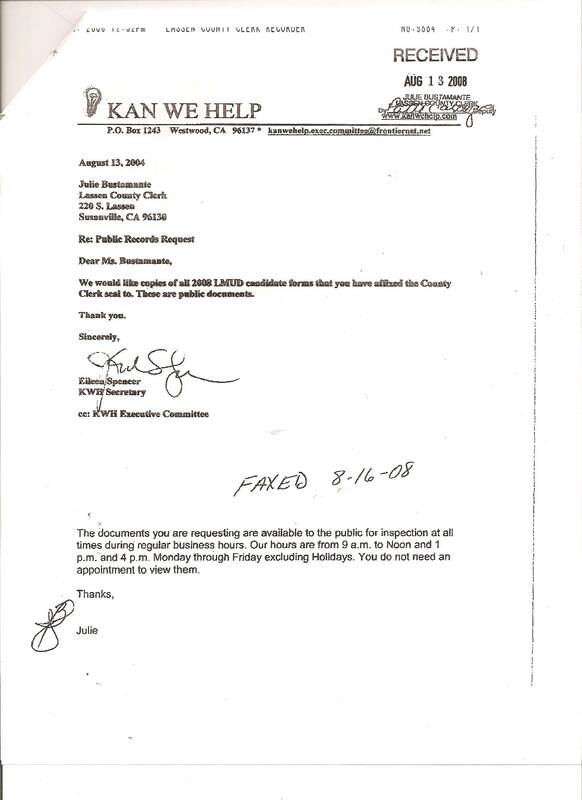 8/21/08: Lassen County Clerk has denied the Public Records Request. She will not make copies of the LMUD candidate form with her seal on it. Paul Rutledge, "special" investigator for the Secretary of State has determined that he will not intervene...."not within his jurisdiction". Paul is affectionately called, in California, as the election "Cleaner". His only job is to make sure that election fraud (any irregularity) is covered up quickly. He protects the Secretary of State, Republican or Democrat, from any embarrassing election "irregularities". Paul has made several trips to Lassen County to assure that the election irregularities here are swept away quietly. Paul is basically the election "wise guy". 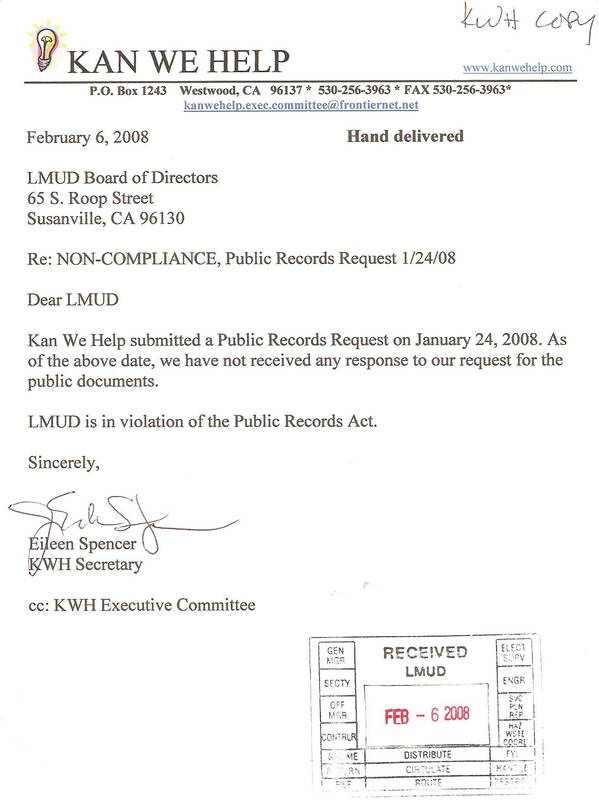 4/15/08: KWH did not receive any response from LMUD. 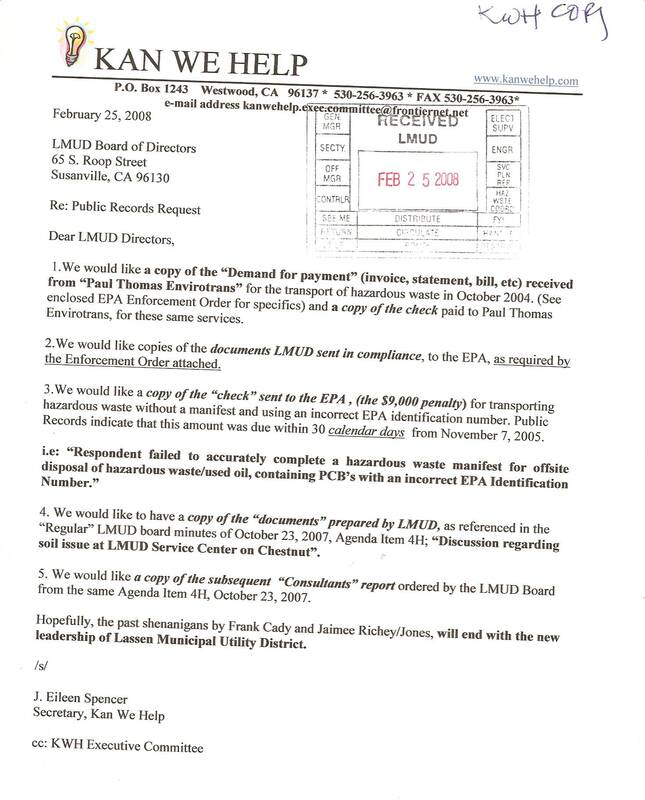 A call was made to the LMUD Board Secretary and the documents (9 pages) were sent via FAX. 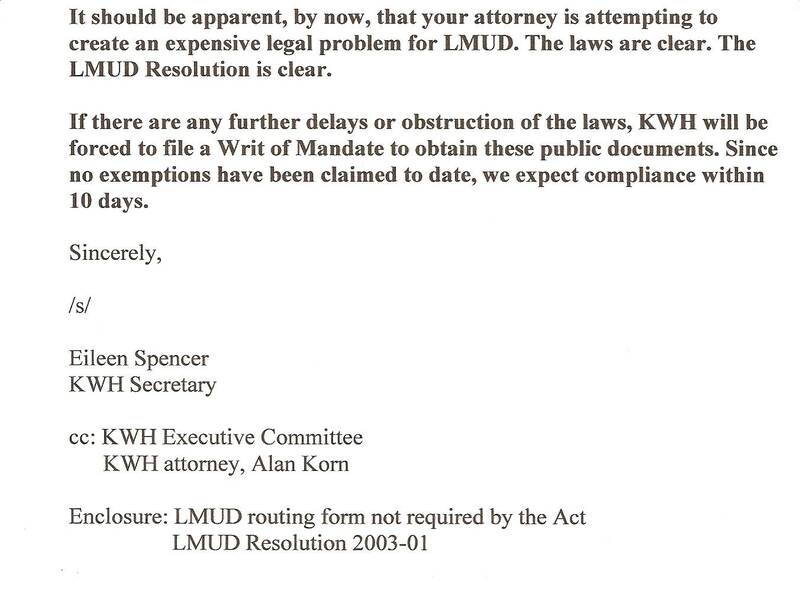 The LMUD attorney told the Board that she had sent them to KWH, when in fact she did not. The LMUD attorney bills by the hour. All documents were so heavily redacted that no identification could be made to determine compliance. 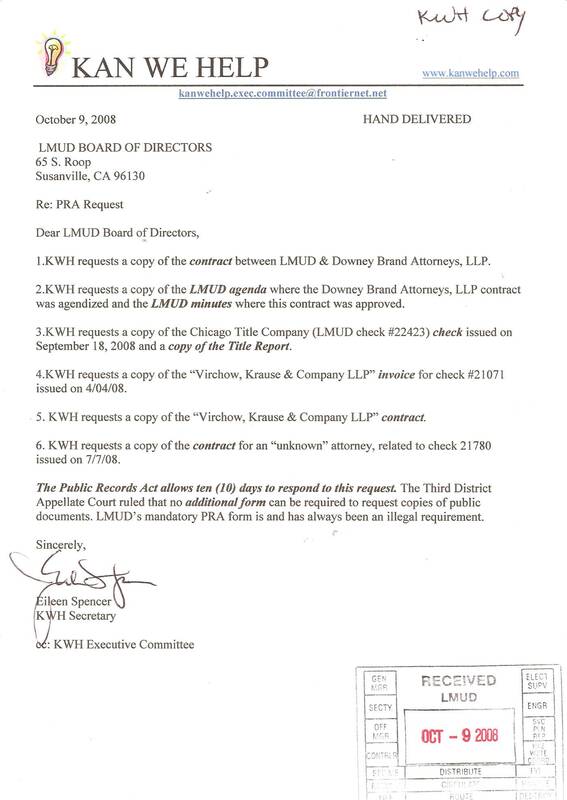 3/27/08: LMUD's attorney complied after a phone call, for assistance, was made to LMUD President Bowden. 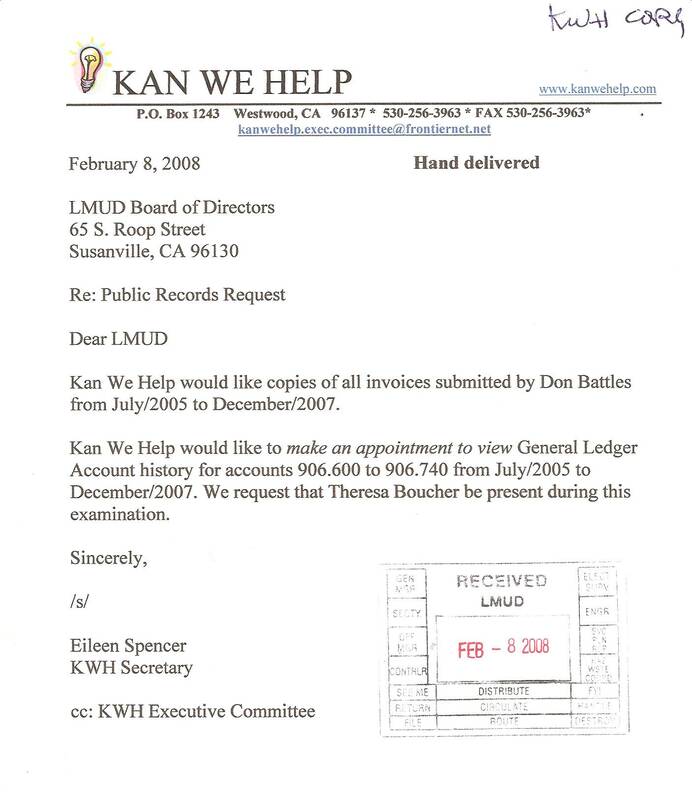 However, documents were withheld from July 1, 2005 to December 31,2005. 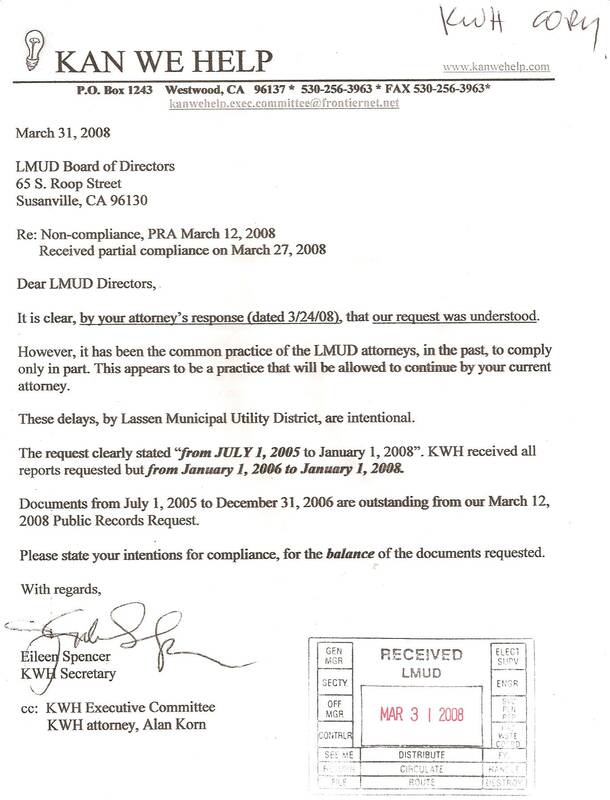 3/31/08: LMUD's attorney did not comply with the Public Records Request. 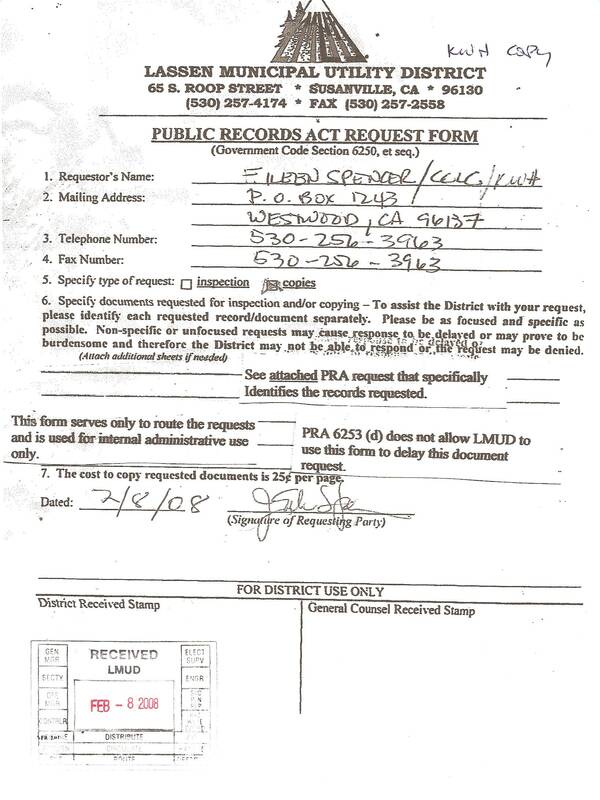 Documents were requested from July 1, 2005 to January 1, 2008. 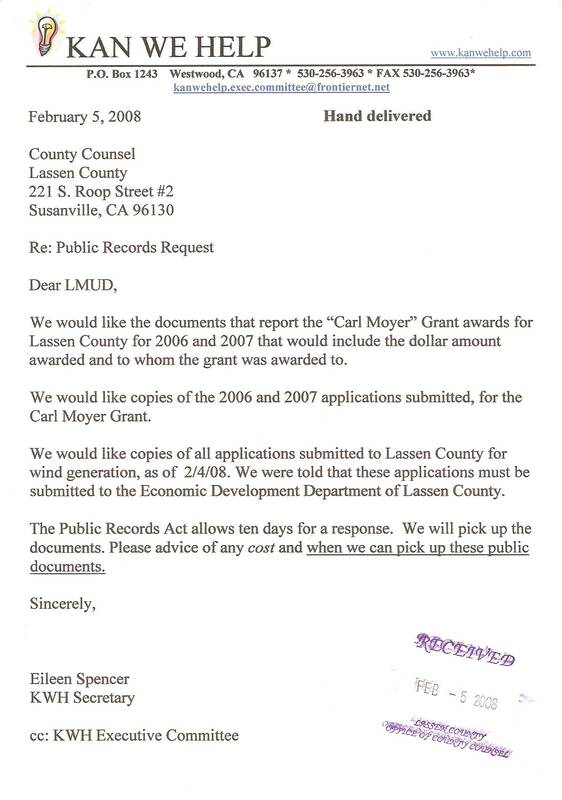 LMUD's attorney intentionally sent the documents from January 1, 2006 to January 1, 2008. A non-compliance letter was sent. 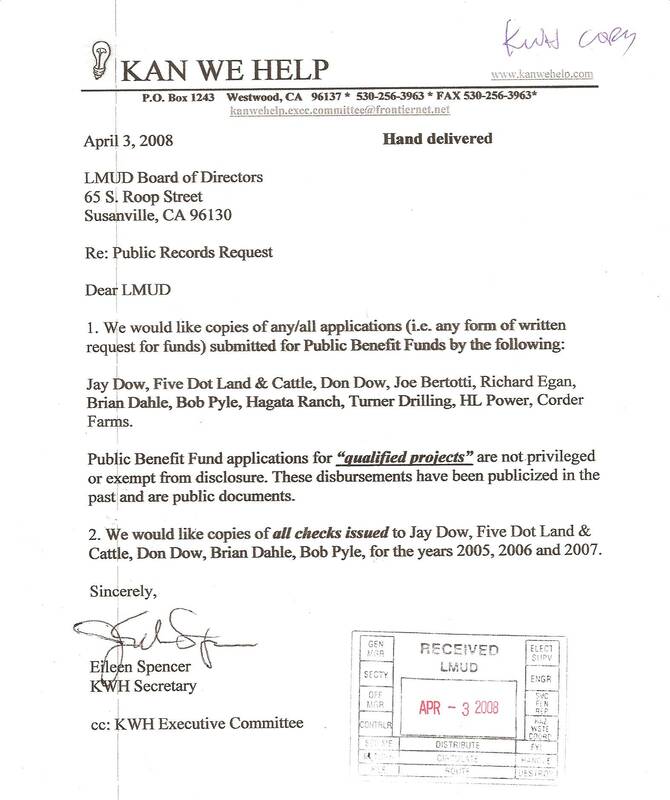 4/7/08: No response from LMUD. 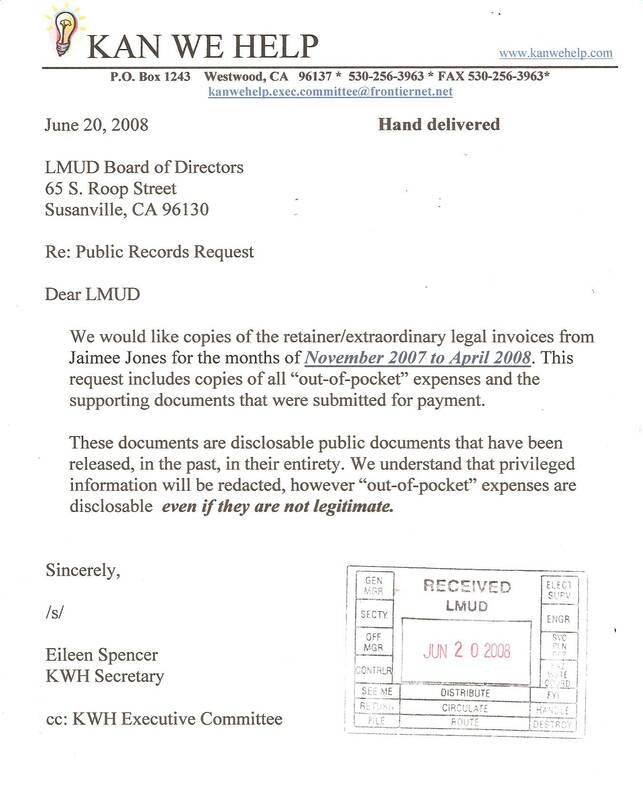 It appears that LMUD intends to withhold these public documents. 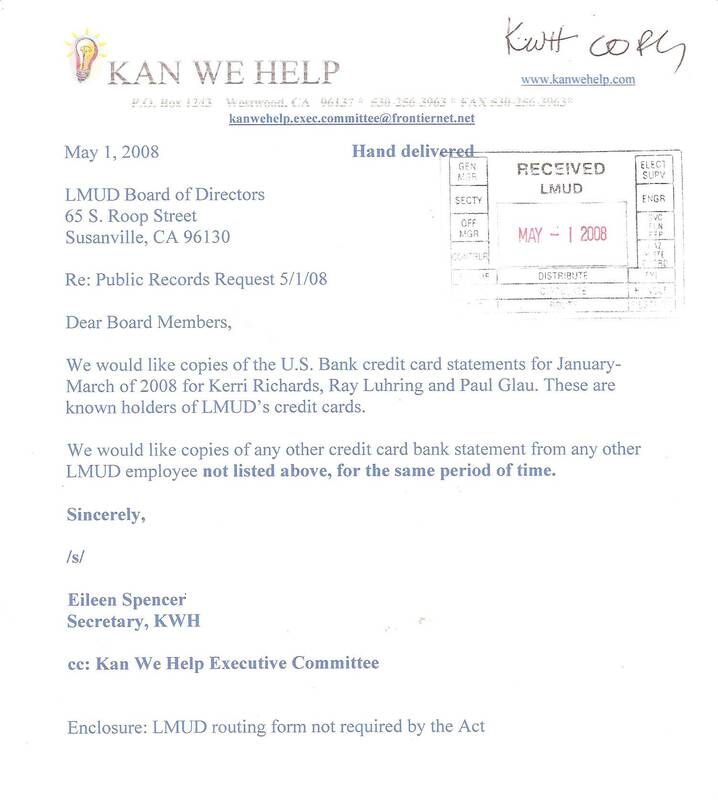 3/5/08: lMUD has requested an additional 14 days stating that this request is voluminous. 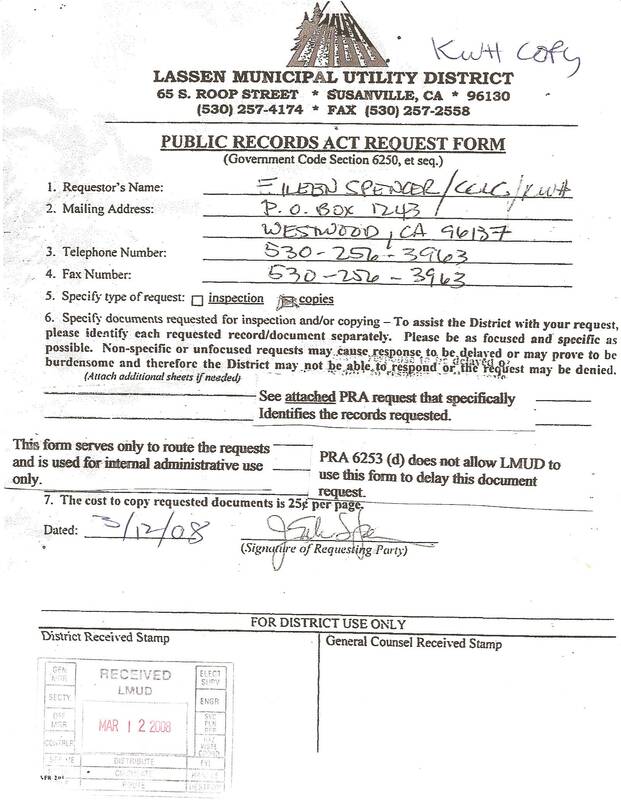 The Public Records Act allows this when in fact the request is "voluminous". LMUD's attorney had abused this in the past. 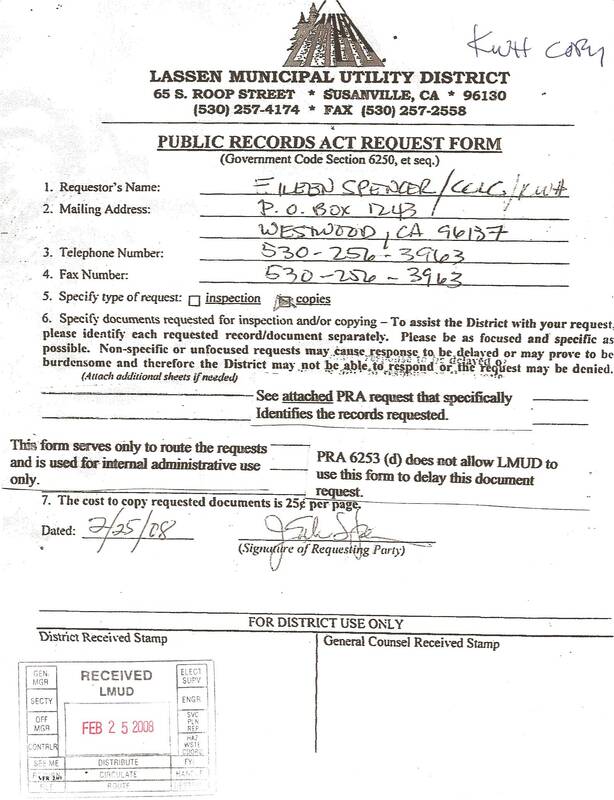 This would make the documents due now on 3/19/08. 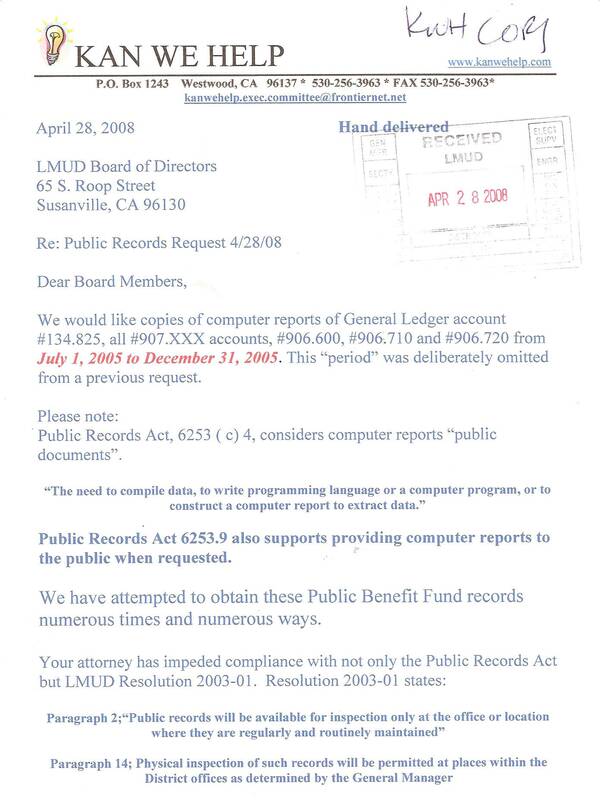 3/24/08: LMUD's attorney has ignored the Public Records Act and continues to withhold these public documents. 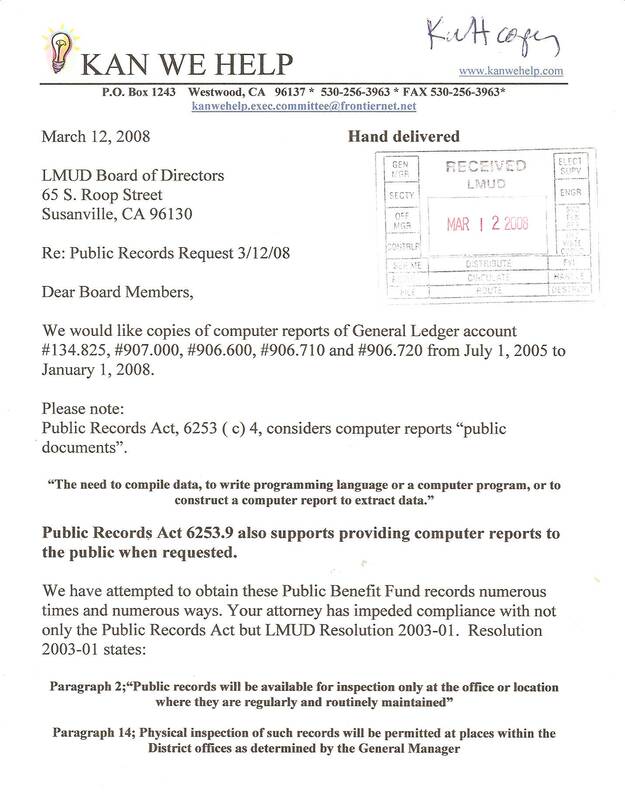 A letter of non-compliance was issued on 3/24/08. 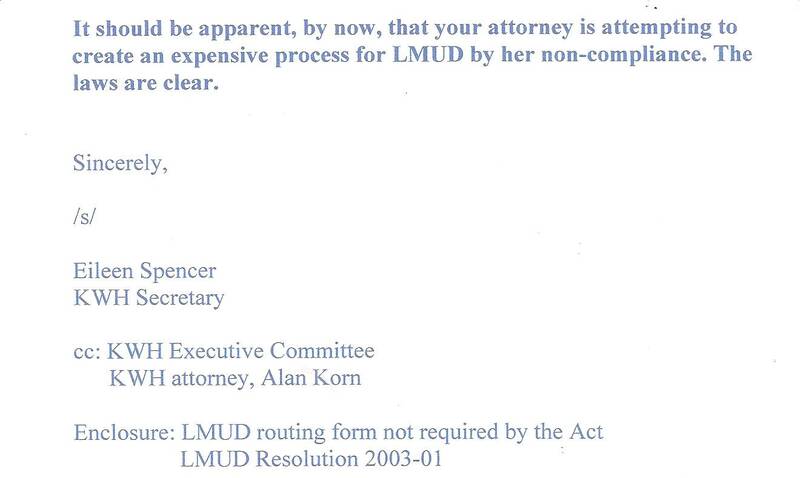 3/27/08: LMUD's attorney complied after a phone call, for assistance, was made to LMUD President Bowden. 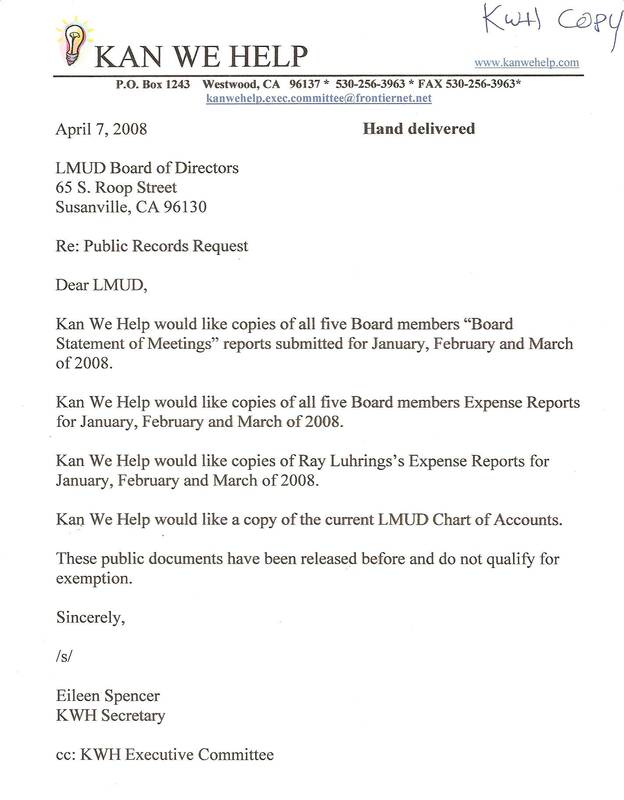 LMUD's attorney backdated her response (3/17/08) so as to make it appear that she complied. 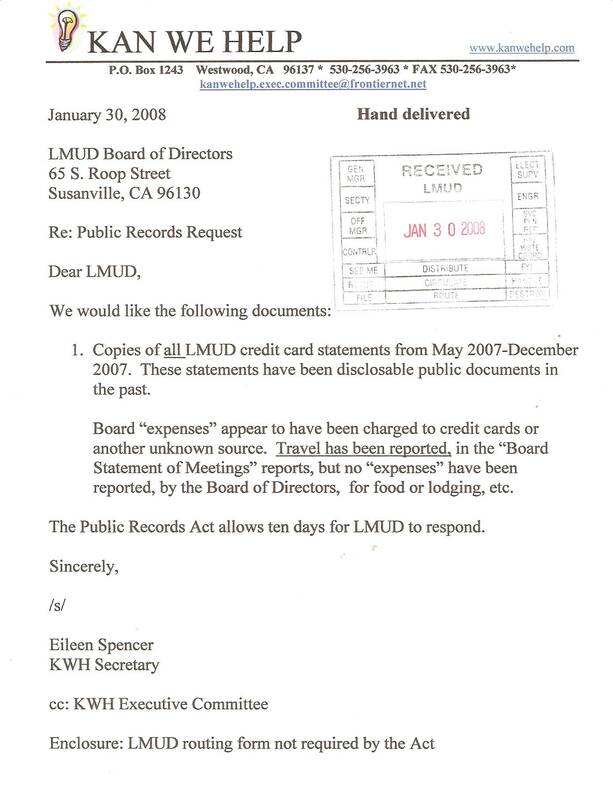 Jones is attempting to move LMUD's public documents to her office. She has attempted this unsuccessfully in the past. 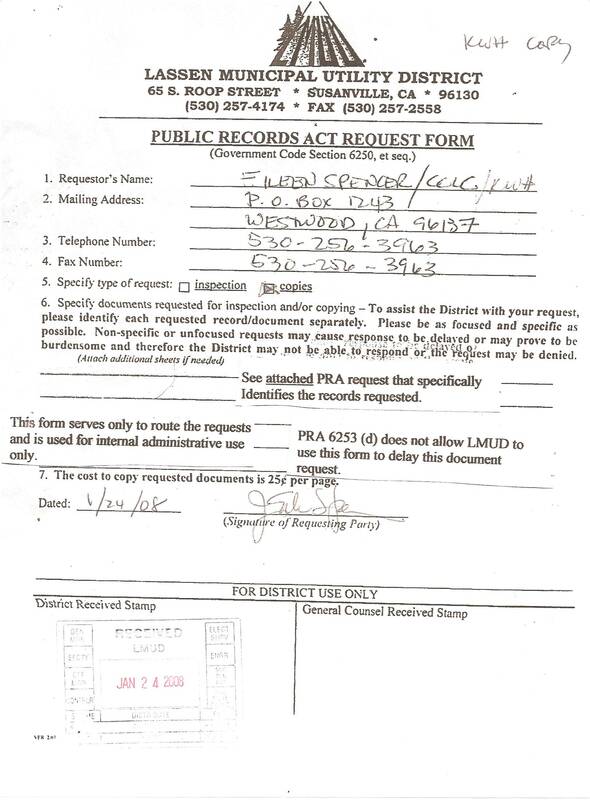 This intentional delay violated the Public Records Act. 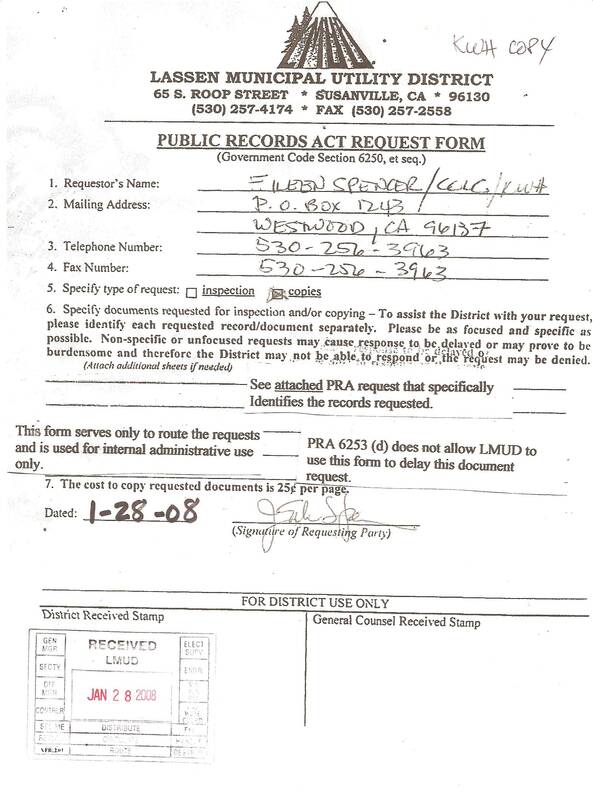 The Public Records Act allows the public access to a public agency's documents, at the public agency during the office hours of the public agency. Jones continues the shroud of secrecy and sends red flags up by her action. The Public Benefits Fund money has disappeared and KWH wants to know what happened to it. 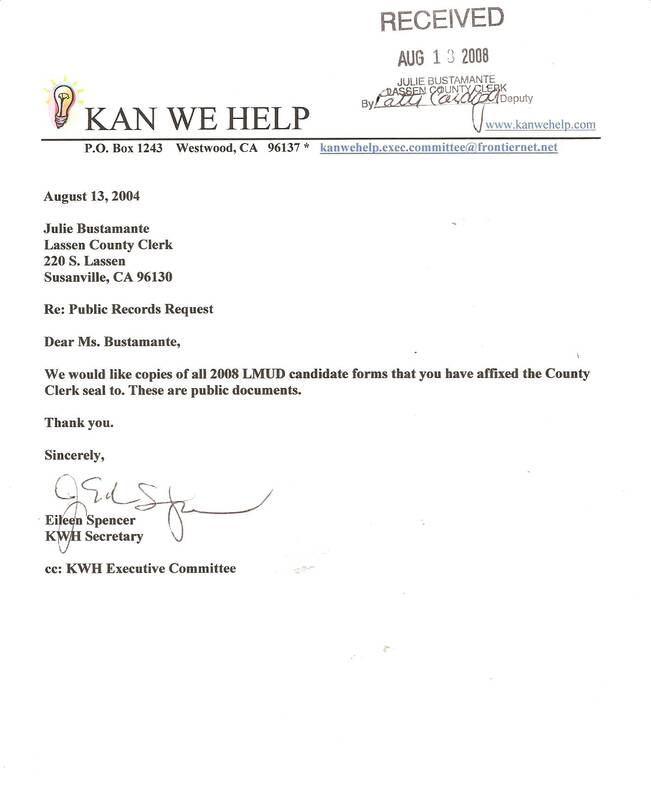 Jaimee Jones released the public records three days late, but notes on her letter to KWH that is was timely. Jaimee Jones dates her response 2/4/08 and "makes" a postage sticker for 2/5/08. 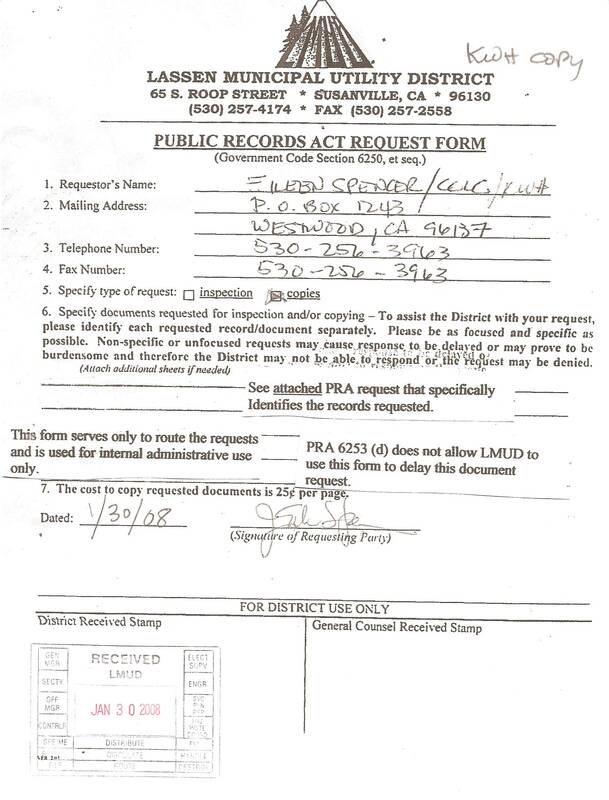 The Public Records Act states she has ten days to respond. 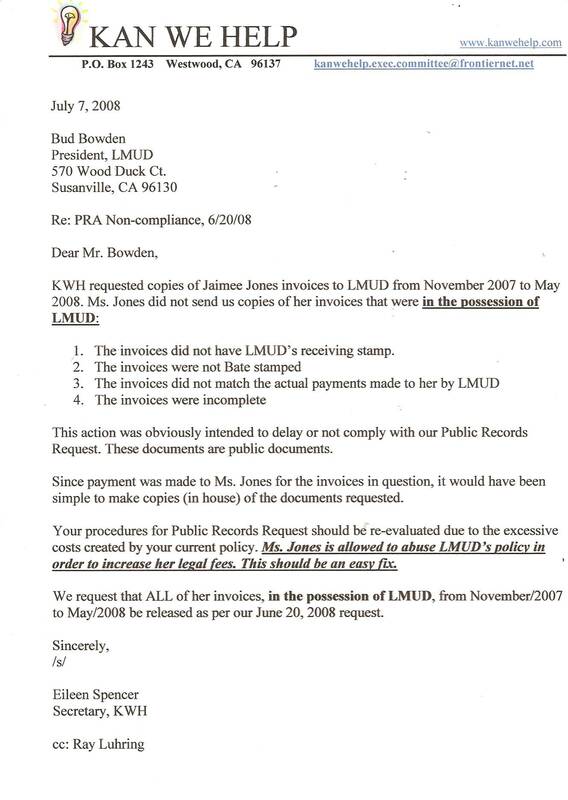 This is a common practice for Jones to back date her documents to appear that she has complied with the law. She complied only after receiving the Non-compliance letter. 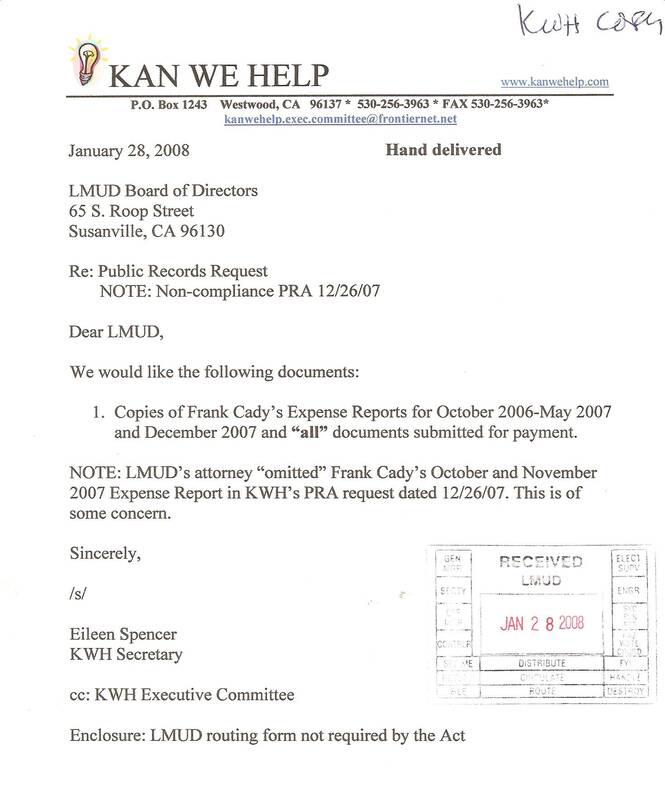 Jones claims now that Frank Cady did not submit any expense reports for October and November of 2007. 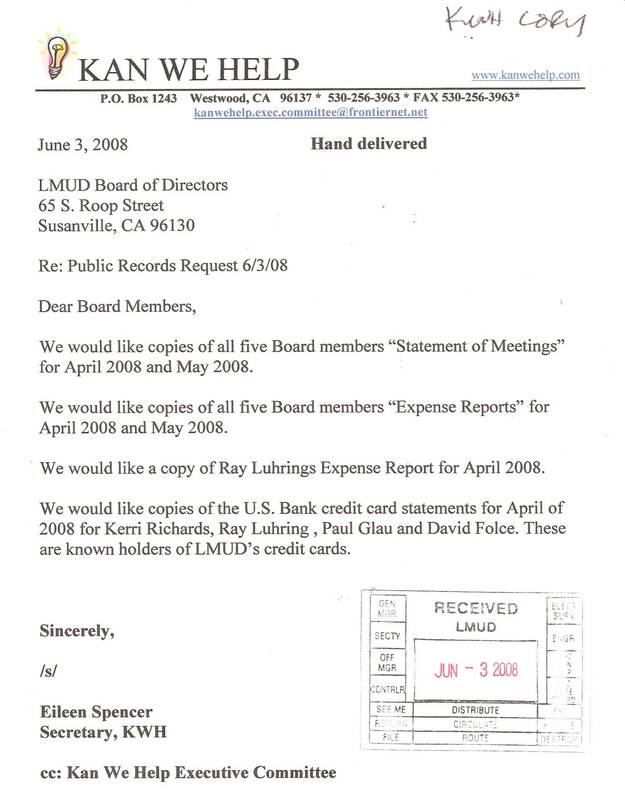 Frank Cady publicly stated that he attended LMUD meetings "out-of-town" in October. Jones declined to release the Public Benefit Fund Applications as requested. These are public documents. 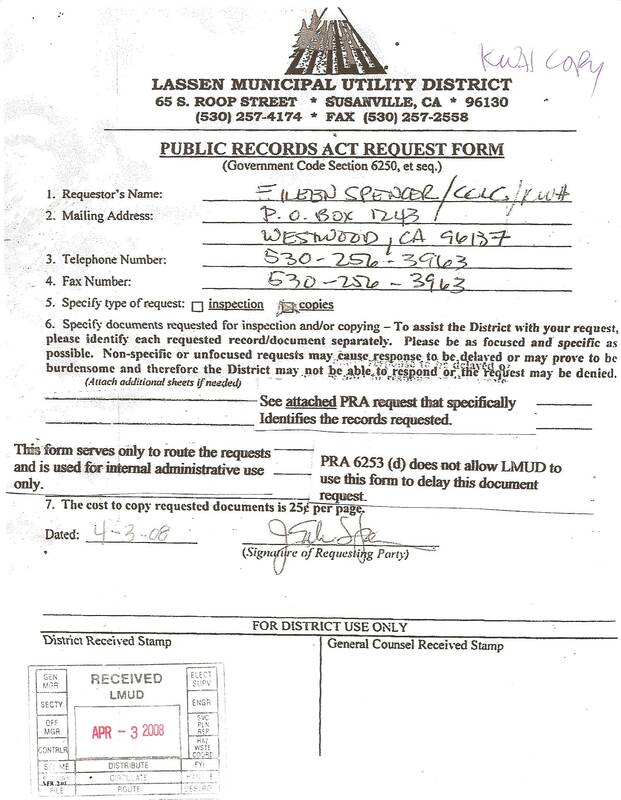 Jones has unnecessarily delayed this request, a violation of the Public Records Act. Jones clearly understood the word "application", but failed to release the documents. 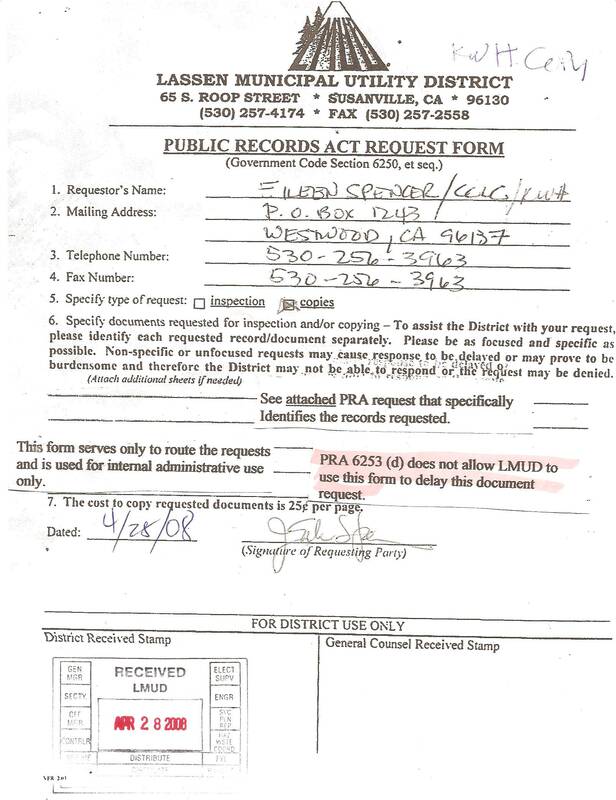 Jones is attempting to move the public benefit documents to her office, but the Government Codes do not allow this. 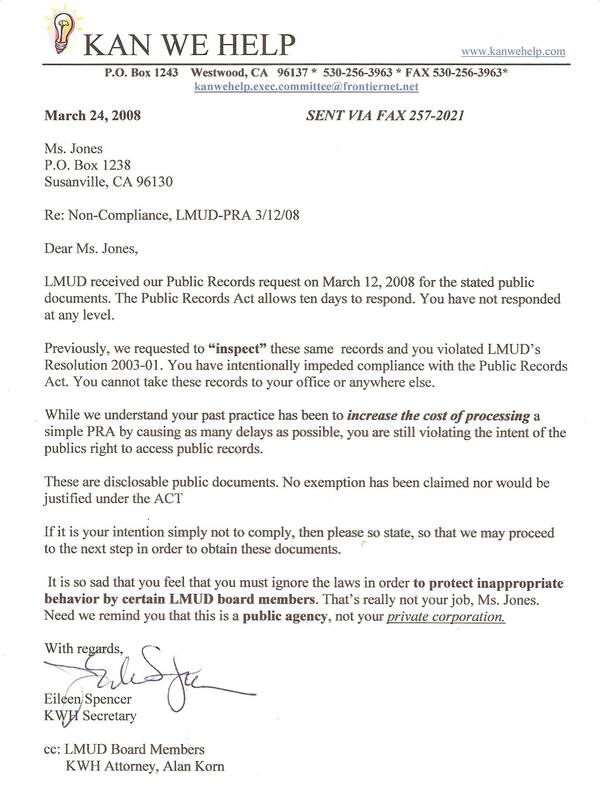 Jones has attempted this delay before and lost due to her inexperience and lack of understanding of the Public Records Act. 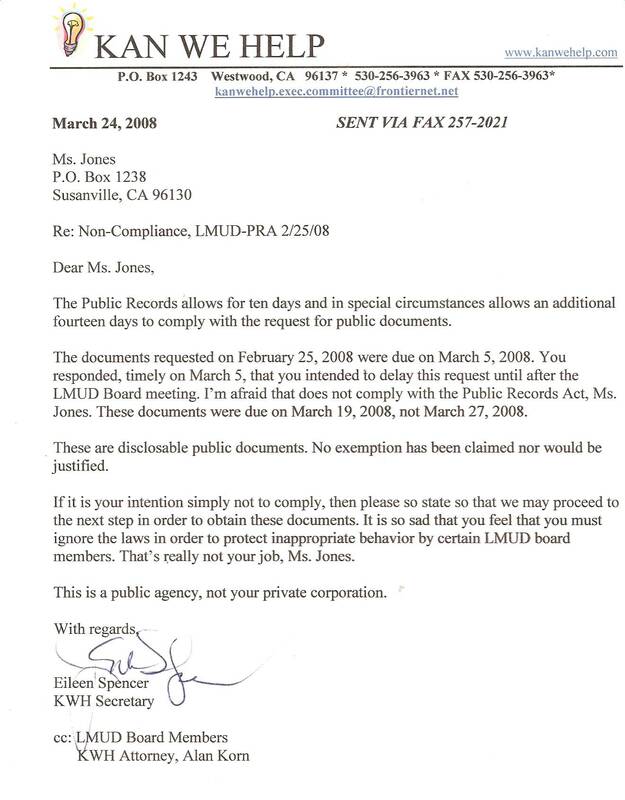 Jones has shown contempt for the law and continues the "secrecy" of this public agency.